The Boston to Provincetown ferry service provides the fastest Boston - Cape Cod connection. Provincetown travel by ferry from Boston can take as little as 90 minutes. Why travel to Provincetown by ferry? If you drive, the distance from Boston to Provincetown at the eastern tip of Cape Cod is about 115 miles and takes 2 1/2 hours - if you're lucky and traffic isn't too heavy. But by ferry, the Boston-Provincetown distance is only about 50-60 nautical miles. 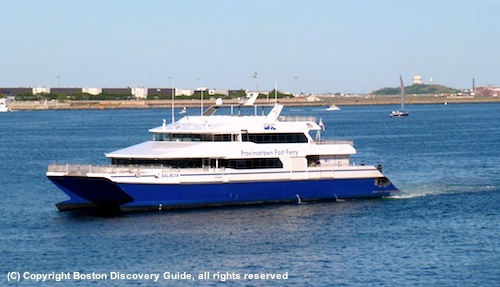 The fastest Provincetown ferry service will get you there in 90 minutes - perfect for a day trip from Boston as you cruise through the Harbor to the Cape. Which ferry companies provide ferry service to Provincetown from Boston ? Bay State Cruise Company (617-783-3779; Bay State Cruise Company website) and Boston Harbor Cruises (617-227-4321; Boston Harbor Cruises website) both provide service to MacMillan Wharf in Provincetown. Bay State Cruise's ferries depart from the west side (city side) of the pier at the World Trade Center (across from the Seaport Hotel) on Northern Avenue in the South Boston Waterfront neighborhood. You can easily reach the pier on the Silver Line from South Station; get off at the World Trade Center stop. Boston Harbor Cruises depart from Long Wharf on the Downtown Boston waterfront. 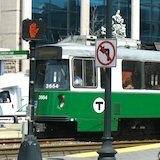 To get there by T (Boston's subway), take the Blue Line to the Aquarium station. Both companies offer fast ferry service (about 90 minutes) from Boston to Provincetown on a daily basis from about mid-May through about mid-October - check their websites for exact schedules. Bay State Cruise Company also offers slower 3-hour service at a lower cost, currently only on Saturdays for a few weeks in July. Spend the day or the weekend? With 90 minute ferry service, you can easily travel to Provincetown from Boston and back in a day - a perfect way to visit Cape Cod for a day trip. But a relaxing or romantic weekend in Provincetown is even better, especially when you can enjoy one of the nicest Boston cruises on the way. Although Provincetown can be on the pricey side in the summer, if you shop around, you can usually find good deals for Provincetown hotels. With plenty of wonderful restaurants, galleries, shops, and nightspots to explore - plus gorgeous beaches - you may become a frequent passenger on the Boston to Provincetown ferry.